Hello! 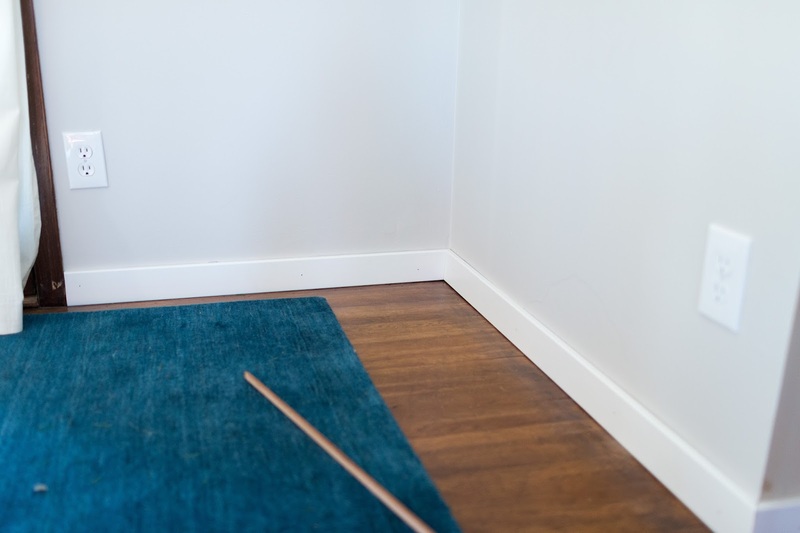 This post is not a (very) belated Christmas decoration update, but instead a peek at our new white baseboards. Just in case you are offended that my blog didn't provide any Christmasy inspiration, I submit the only good holiday-esque photo I took this year...and that isn't even our tree! 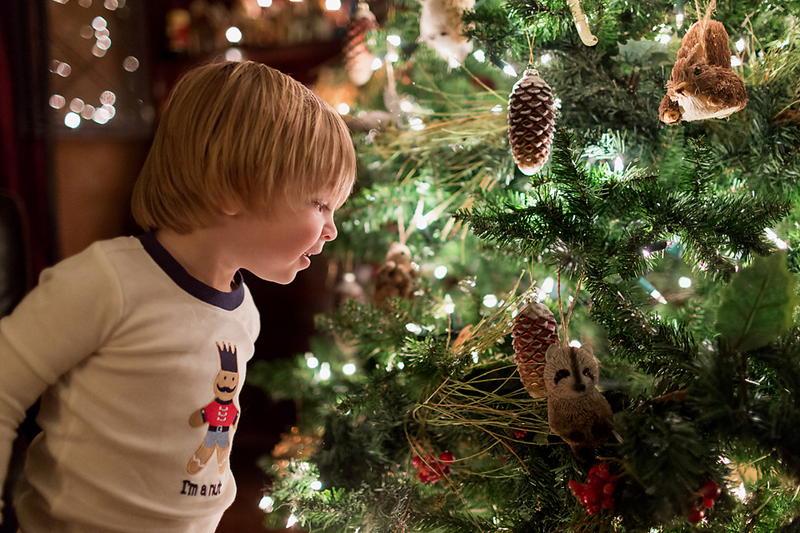 I could not get this child to sit remotely still or even stand by our tree, so I put a cookie on the branch of my mom's tree and told him he could eat it if he could find it. Success! I had to act fast though, he can sniff out a cookie like a bloodhound. 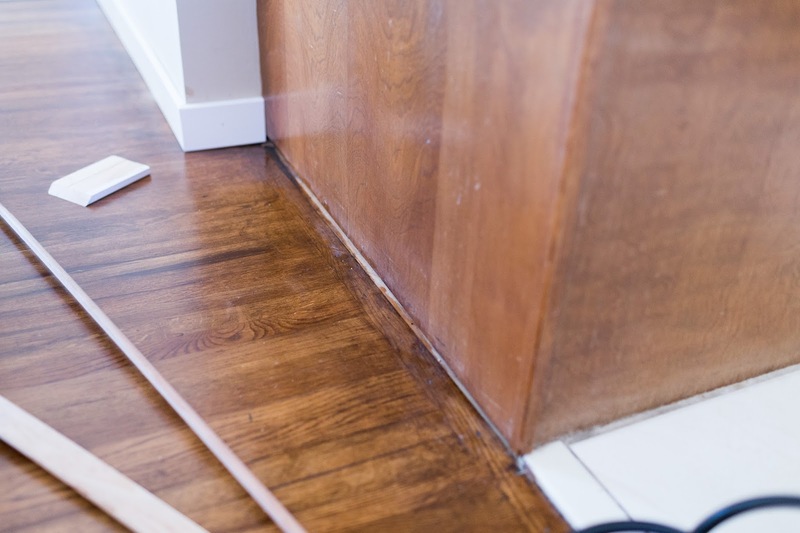 So, back to our baseboards! We started our installation in the dining room because it seemed like the easiest space to handle. 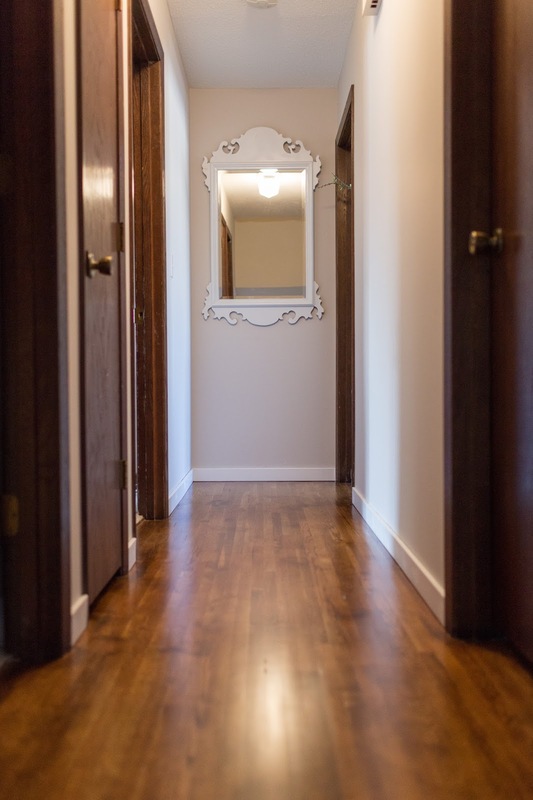 It was exactly as I had envisioned it with the pale gray walls. We had this space between the back of the cabinet and the floor that needed to be addressed. We got a simple lattice trim to cover it, I will either paint it white to match the trim, or paint it the color of the cabinets. I'm thinking it will be the cabinet color - whenever those get painted! I'm not even close to deciding on that. 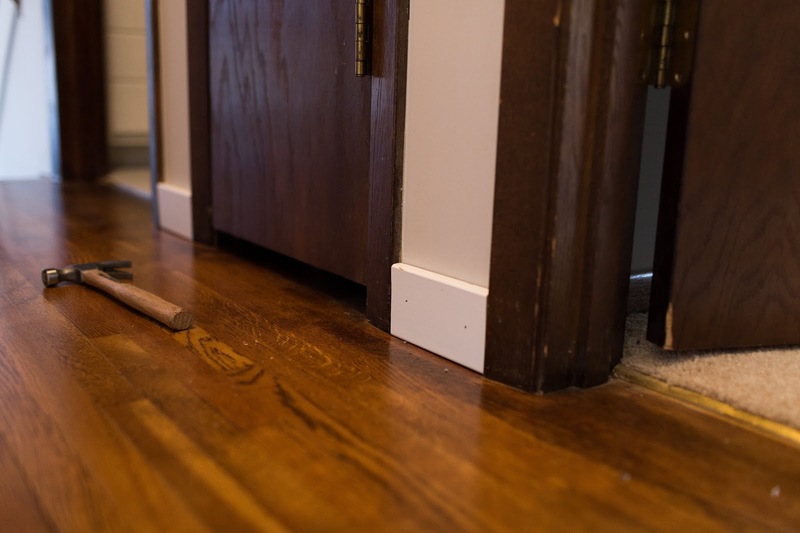 The problem we have on the main level is all the tile next to the hardwoods in the entries and kitchen. 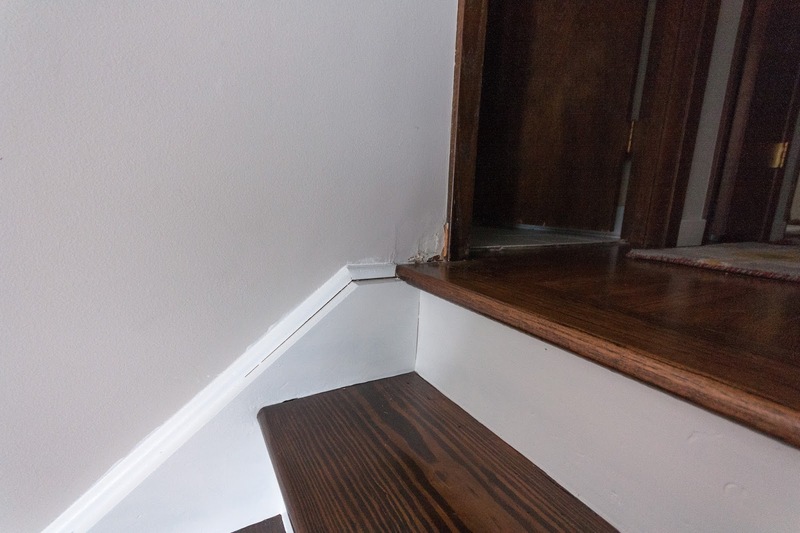 We don't have a table saw, or any other way to rip the trim to fit over the tile, so I'm not sure if we will buy the tools we need, or hire it out. I was a little worried about the area butting up to the coat closet door. Luckily, the little piece on that side fit fine and the door was not a problem. 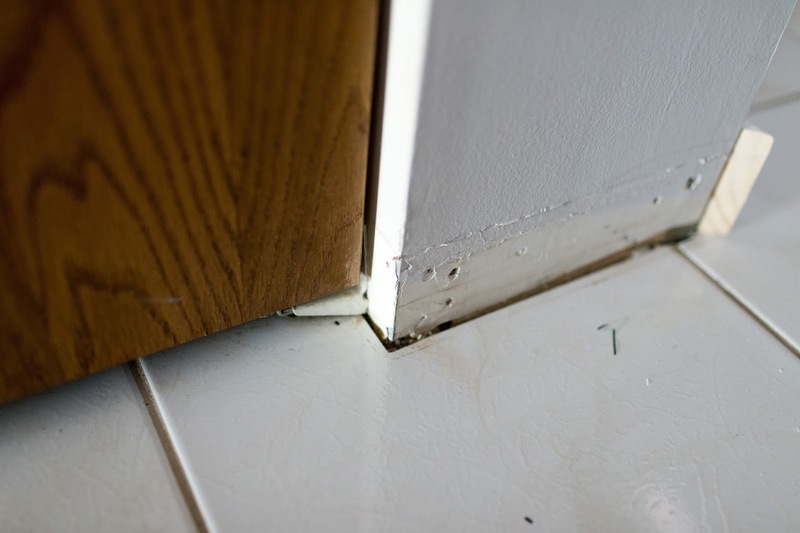 Every little piece of trim that goes over the ugly bare spots is a victory! I was worried about the white trim looking weird with the white tile, but I think the paint color I chose (Behr Popped Corn) looks fresh without being too stark against the creamy tile. The real test of how this was going to look was in the hallway. There are a lot of doorways with original 70s casing. I was unsure about keeping the casing and doors dark when this was going in. But when it was all in, I liked it much more! I think it will be even better when I get more things on the walls, and a new brighter light fixture. The next thing up was addressing the stairs. 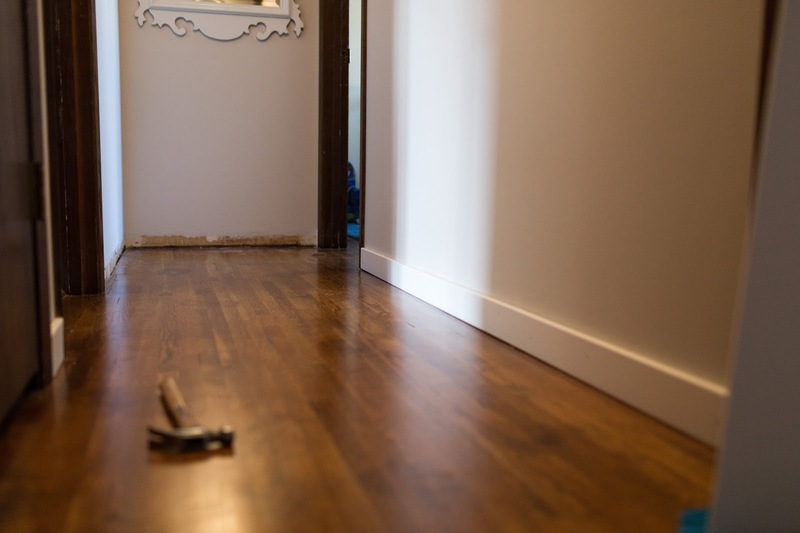 While I really like the rich look of the wood, I knew the risers and stringers needed to be white to match the baseboards. I used my absolute favorite primer, BIN to prime everything. It looked terrible but was ready for paint! 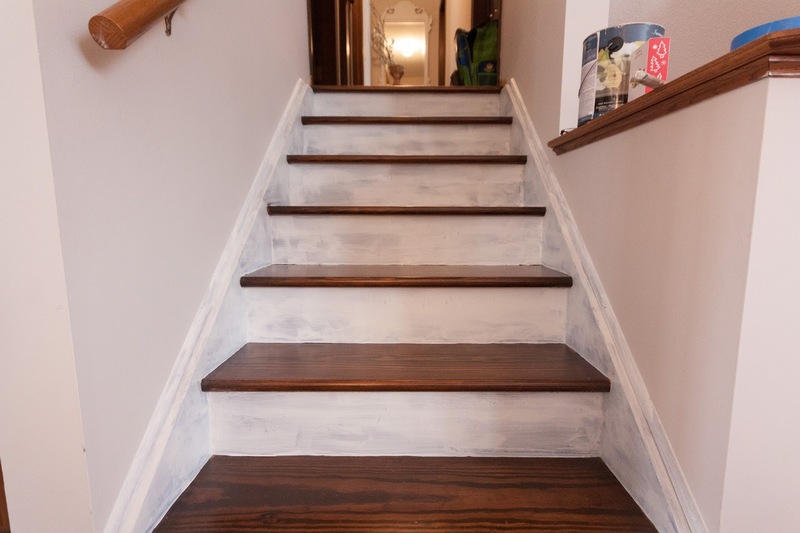 I freaked out a little because when we refinished the treads, there was a little build up of poly on the edges, so it made a clean line with the paint almost impossible. 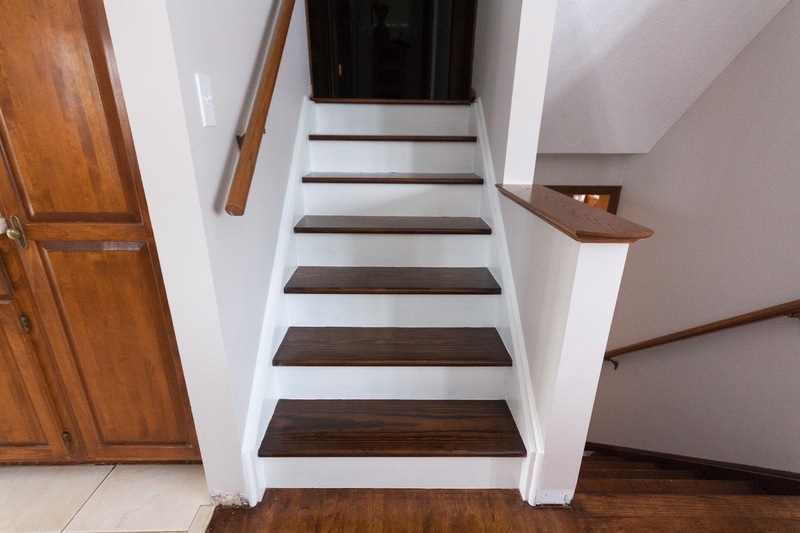 Also, these stairs probably weren't meant to be stained, the treads are cheap pine and not super even along the edges. Even still, it looks pretty good after two coats of paint! I still have to buy and stain some cove trim for underneath the lip of the treads to make it look more finished. 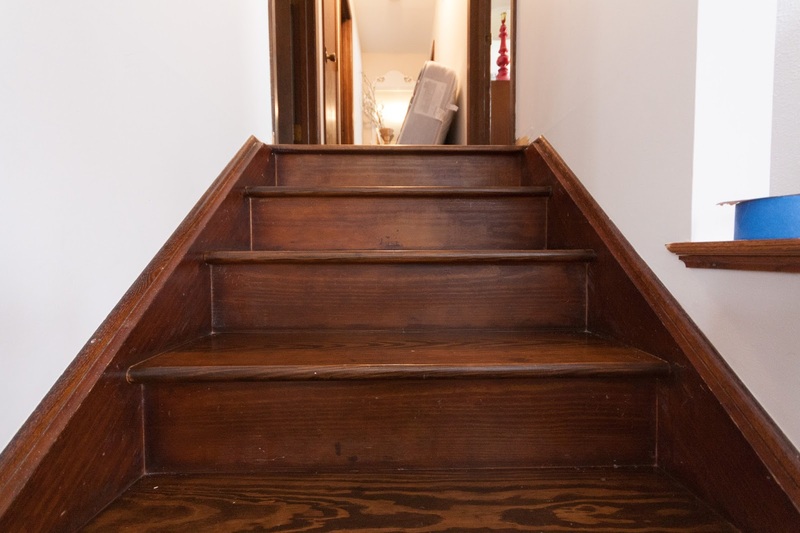 I also have to figure out how to transition the top of the stairs to the hallway trim. Oh, and restain the handrail. Here you can see I also have some caulking to do! So, that is what I've been doing since December. I appreciate everyone reading the blog, even though I don't post very often. I have been working on other spaces over the holidays, too...I hope to post about those sooner than a month from now this time! 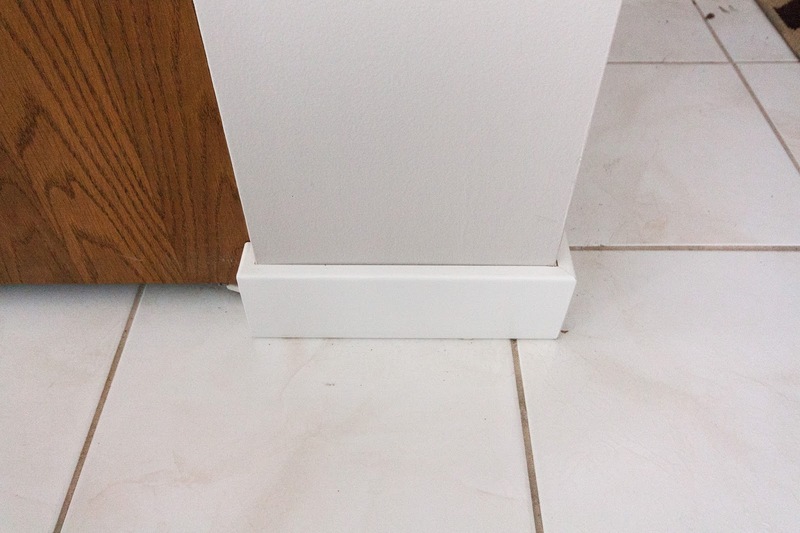 Does anyone have any tips on ripping the base trim to fit over the tile? 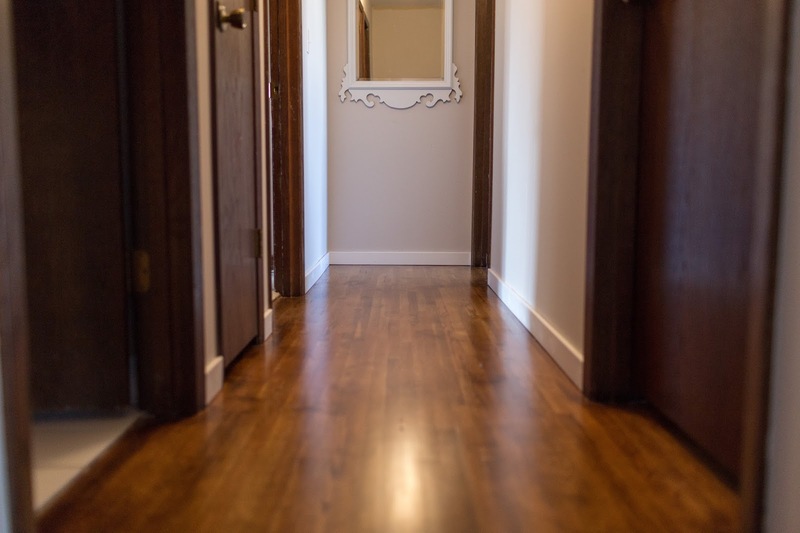 Does your parks and rec center or community have a wood shop that rents time? The trim looks so good and so pretty!! I think this all looks amazing! You really have a knack and the eye for this stuff!! I need you to come visit me in Alabama immediately ;) (we just repainted our kitchen for the third time since moving in last year and I think we finally found a winner - gray walls, brown cabinets and white backsplash - we planned to paint the cabinets but honestly right now with the new paint that isn't red (original) or green, we're totally happy with them as is. The steps look awesome! I've always loved this look. I wish we could rip the carpet off our steps, and we may one day - but I'd rather be prepared to put new carpet down incase they are crap. 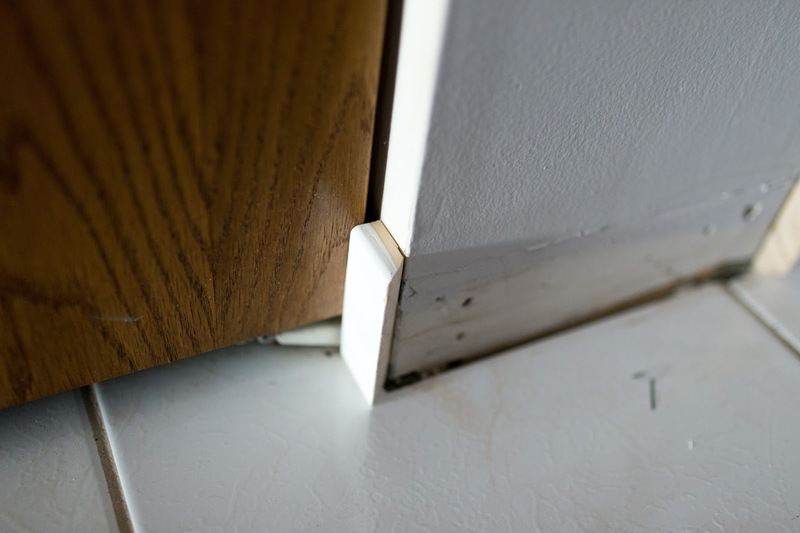 I'm not sure what you mean by ripping the trim to fit over the tile... is it because the tile is a little higher than the wood floors? 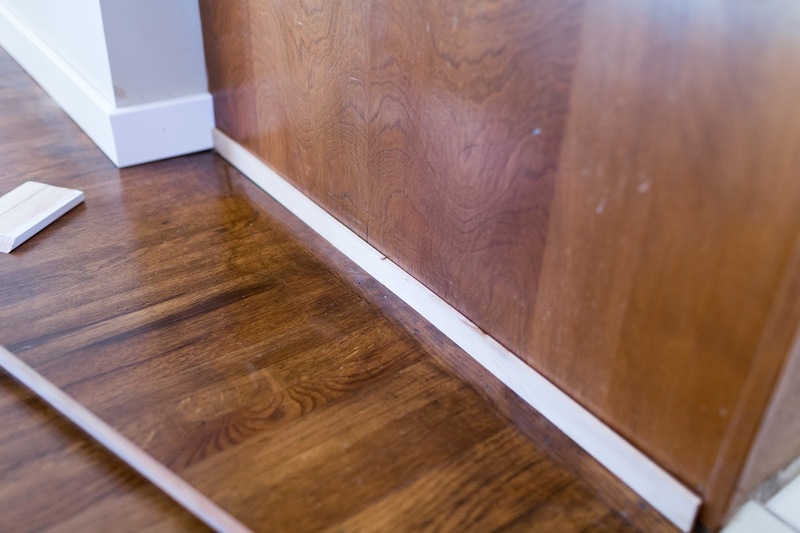 Do you plan on adding quarter-round (aka "shoe molding") to cover all the gaps? 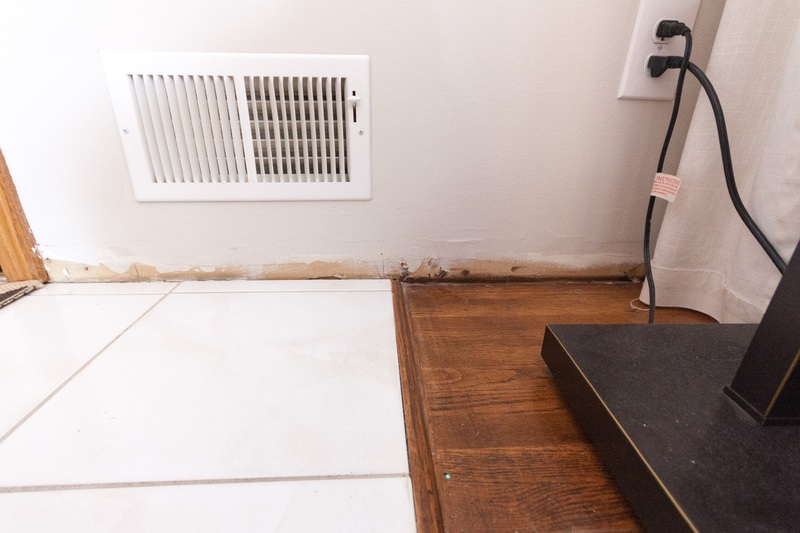 If so, you can probably just put the baseboards straight across, and if the shoe molding is high enough, it should cover the gap between the floors and the baseboards. I'm still here! I love the way you look at things... Everything is always the perfect mix of modern and retro. Katie, yes the tile is higher and we are not using shoe. That is what they had done before, and it looked funny to have the trim going uphill.